Home » Copycat Restaurant Recipes » la Madeleine’s Country Potato Soup – hearty potato soup that is perfect for dinner. 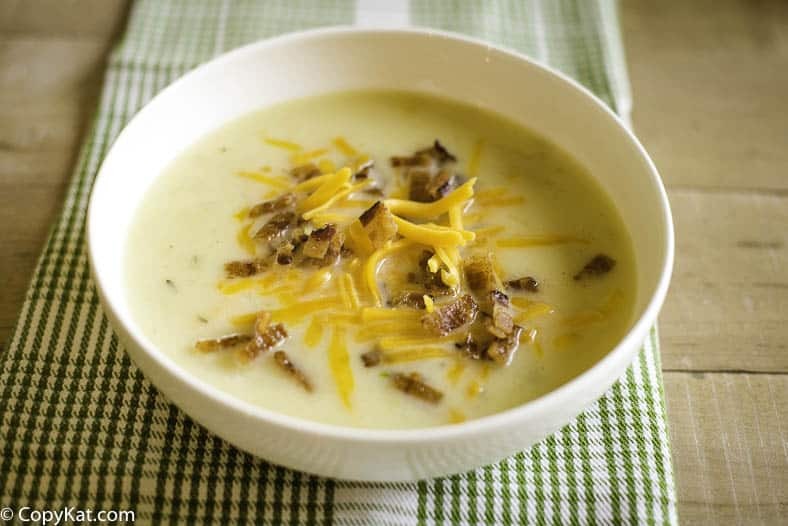 la Madeleine’s Country Potato Soup – hearty potato soup that is perfect for dinner. La Madeleine’s Country Potato Soup is wonderfully creamy and rich potato soup. 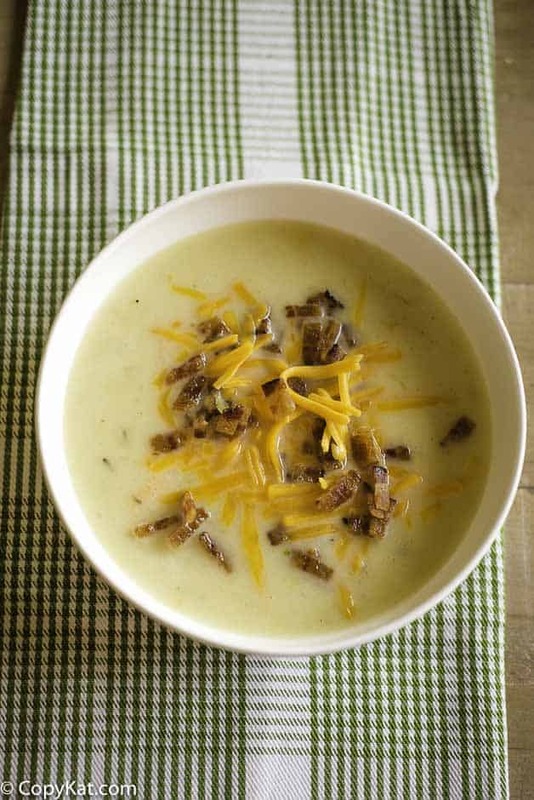 What makes the La Madeleine county potato soup so good? La Madeleine makes a delicious bowl of soup due to the leeks that are added to this potato recipe. Leeks had a mild flavor that taste like mild onions. This soup uses onions in addition to the leeks, but the leeks really give this soup a very subtle flavor. The soup starts out like many soups, you will saute the leeks and onions in butter until they are tender. 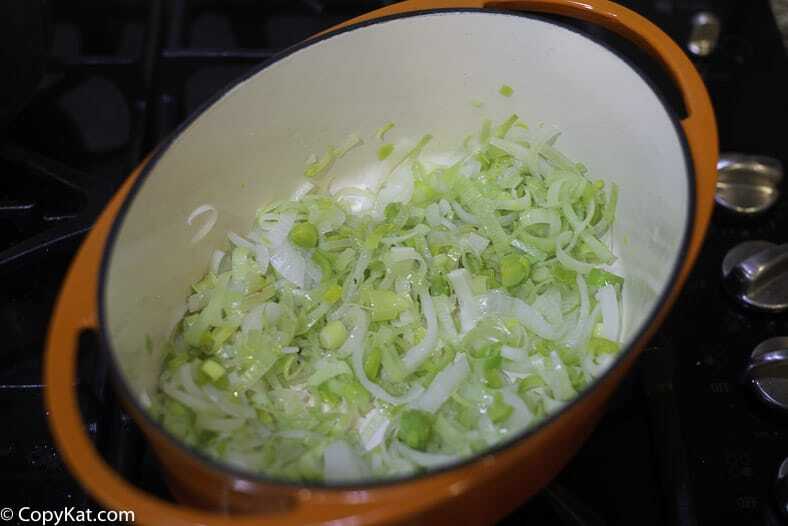 When you saute the leeks and onions together, you do not want to allow the leeks and onion to brown. Allowing the leeks and onions to brown will give the soup a nutty flavor that isn’t quite right for this soup. So cook the onions and leeks until the leeks change color, and the onions become translucent. 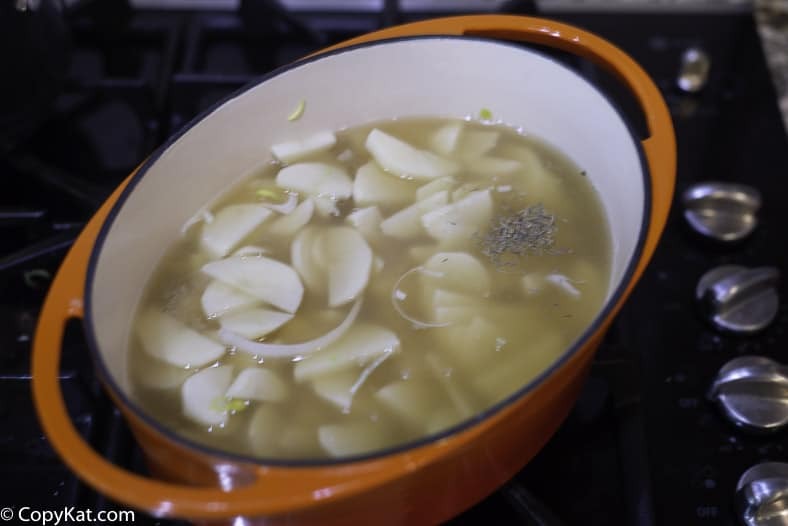 Once the leeks have cooked to perfection you will want to add the chicken stock, thinly sliced potatoes, and thyme. You will gently cook the potatoes so their starch breaks down slightly and gives the potato soup a creamy texture. You can use fresh or dried thyme, but try not to omit the thyme because it adds a richness to the flavor of this potato soup. You will cook the potatoes for about 40 minutes. If you have tried this soup before, the texture of this soup is a pureed soup. You can puree the soup by using an immersion blender, or you can carefully puree the soup in a standard blender. After the soup is pureed, it should be brought to a boil, and a small amount of heavy cream should be added to the soup. Make a hearty bowl of la Madeleine's Country Potato Soup today. 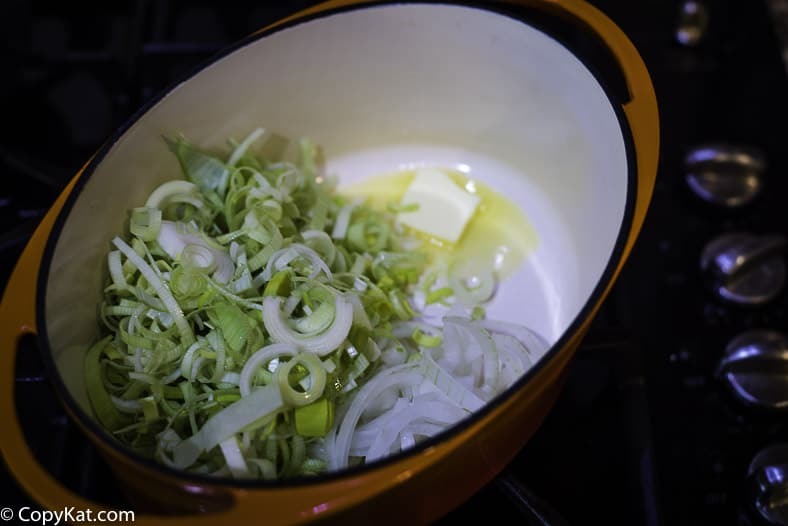 In a large saucepan, add butter, leeks, and onions, and cook over medium heat. Add a pinch of salt to the leeks and onions as they cook. When the onions have become translucent, and the leeks change color and the chicken stock. Add potatoes, salt, and fresh thyme. Cook for 40 minutes over medium heat, stirring frequently to avoid scorching. Puree soup with an immersion blender, or with a blender. Add cream, bring to a boil and serve hot. Garnish with Cheddar cheese and diced bacon. This recipe is from Executive Chef Remy Schaal of la Madeleine French Bakery and Cafe. Founded in Dallas in 1983, la Madeleine has many neighborhood cafes and bakeries in five states and Washington, D.C. Excellent potato soup! 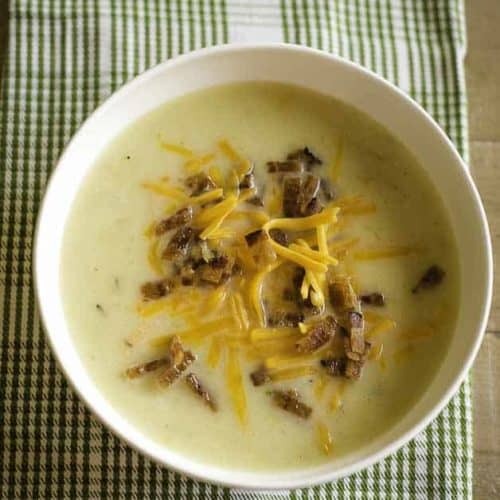 If you like thick potato soup you can add an additional potato or two to this recipe. You can add about 1/2 cup cheese to the soup to turn it into a cheesy potato soup. this is very close to my mother’s recipe. no cheese though. try garnishing with either a quartered hard-boiled egg. I bet that is delicious made like that! This was fabulous. The only changes I made was to make a roux with the cream and added sliced/chopped carrots along with the potatoes. Just melted a few TBs of butter, added a little flour and once thickened, added the cream. Once thickened it was added to the soup mixture. So tasty! I always get potato soup when I’m eating out! This will be a real treat to make at home!